“The history of Somerville, 2010-2100″ is now online! The first version of the website and book for “The history of Somerville , 2010-2100″ project is now online! To download a free PDF of the book, click here. To view the project’s website, click here. “The history of Somerville , 2010-2100″ is a community art project that is exploring what the future might be like. Both the book and the website present what we’ve found by talking to Somerville community members about the future. In the book and website, you’ll also find official government plans, think tank vision statements, and various ideas and concerns about the future from various other sources. The Timeline section presents this material as a single timeline. In the Predictions Archive section, you’ll find the actual predictions that community members made. We’ll be collecting predictions until the end of the year. If you’d like to make a prediction, please email Tim at future.of.somerville@gmail.com . All participants will receive full credit for their images, concepts, stories, and data. All material received by Dec. 31, 2010 will appear on the project’s website and in the final version of the book. This project is organized by Tim Devin, and is sponsored in part by the Somerville Arts Council. The project is also on Facebook here. 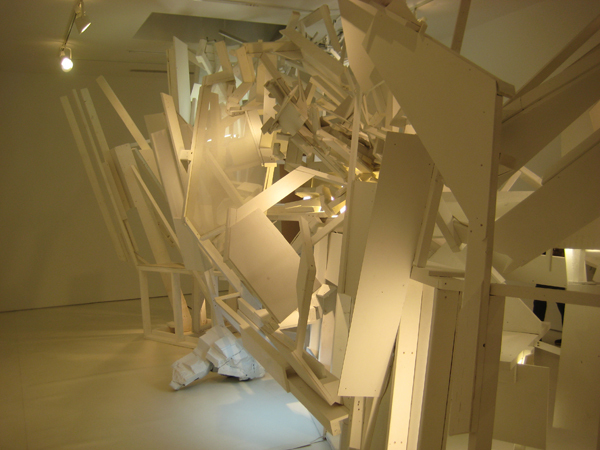 Heidi Kayser and I are working on an installation for the Melle Finelli Studio , the opening is March 5, 2010. Melle Finelli and Peter Harris have generously invited us to do a project in their jewelry and art gallery space in Boston’s South End. The title is “They believed every word.” It’s like a translation or synonym for “They fell for it, hook, line, and sinker”. (The hook, line, and sinker phrase came up because of the fishing-related materials) With the title “They believed every word” we imagined our viewers questioning their trust of words and mediation in the work. 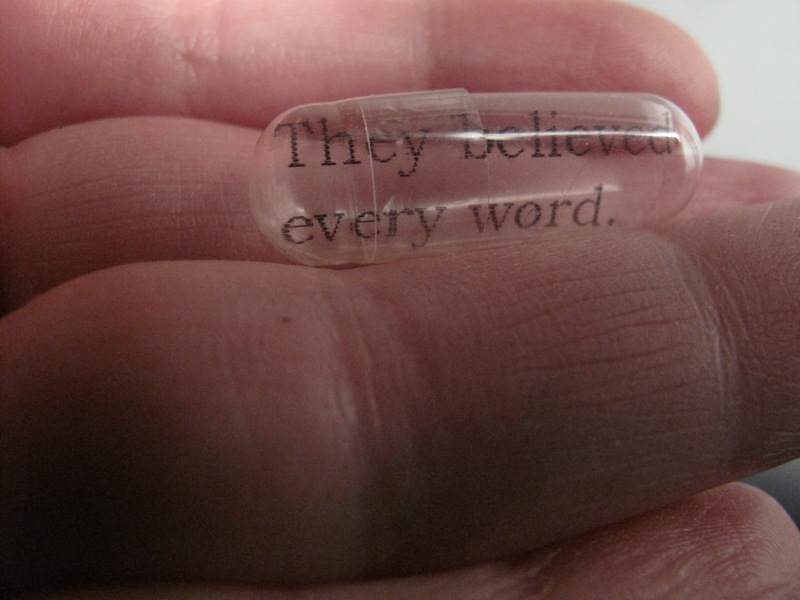 Also the “they” is sort of like the gelcaps, as representatives of individuals. 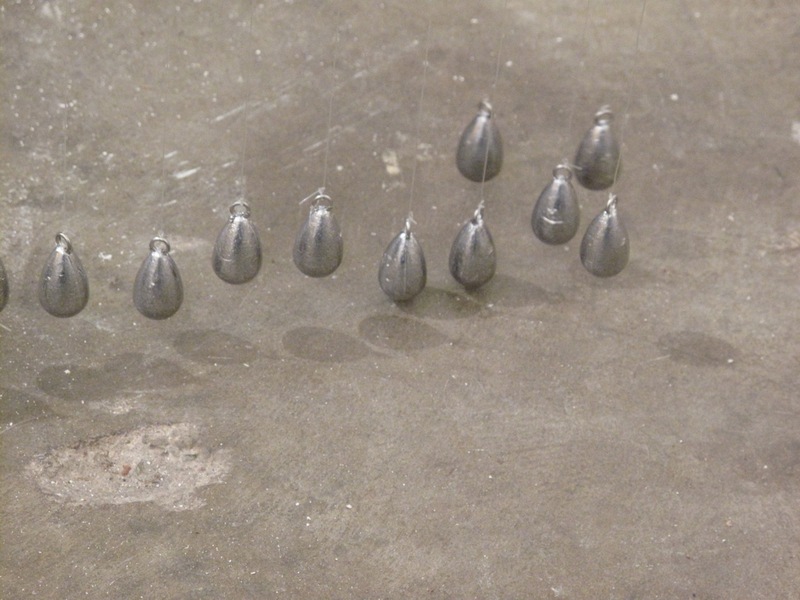 So now we’ve been installing for about a week, hanging hundreds of the gelcap/fishing line/bell sinker assemblies. It’s going pretty well! It’s exciting to see the work actualized. Ideas and experiments with text and lighting have evololved too. We’re concerned about viewers walking directly into the art and tangling it. It’s quite subtle , so, we’re also mulling over ways to make it clear to gallery goers that they should be careful. The project is going well! 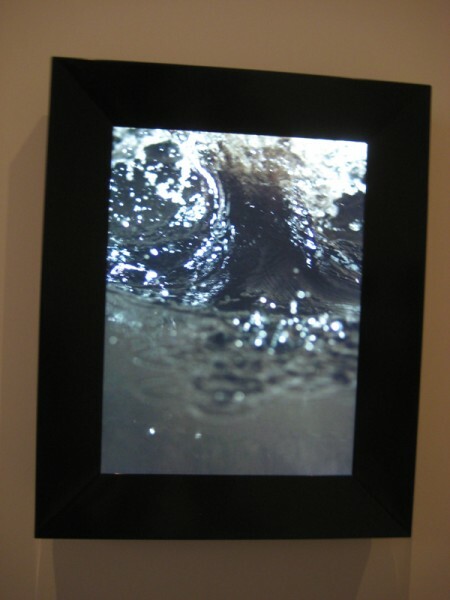 My video installation, Anza-Borrego Expanded Landscape, is showing in a storefront in Long beach this month. It was actually installed in a different storefront down there last month, but I have reconfigured it and moved it to a new one, and this installation is a much better version of it, if I do say so myself. This is part of the Inspired by TED show, and is up in coordination with the TED Conference happening now at the Long Beach Convention Center. There is a reception tonight, check the Facebook page for more info. See the Phantom Galleries LA Long Beach page here. Its at the Pike down in Long Beach, which is where Aquarium Way hits Paseo just a block from the Conference Center. My location is across from Sharkys Mexican food and next to the Coldstone. So get some ice cream I guess. Its very subtle and looks like a dark window at first, so keep your eyes peeled. Mapped here. For more info on the piece, check my site. Last weekend Michele and I met up with our friend Roz to check out some of the work showing over in Culver City. A bunch of spaces were open late Saturday in concert with the LA Contemporary Art Fair across town in the Pacific Design Center. 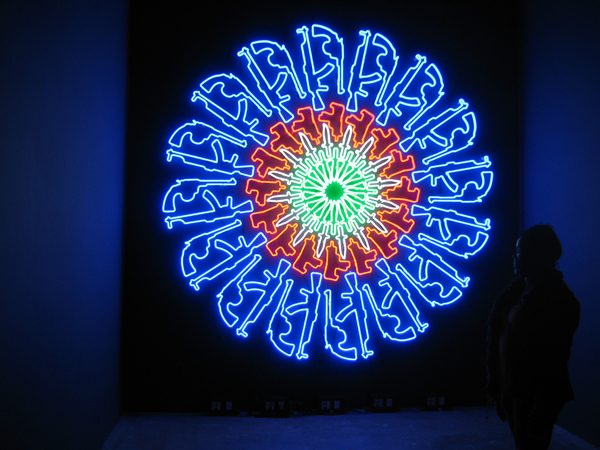 We managed to find some great stuff here and there, like the above neon wall piece, ChakrAK-47 by Artemio at LAXART. 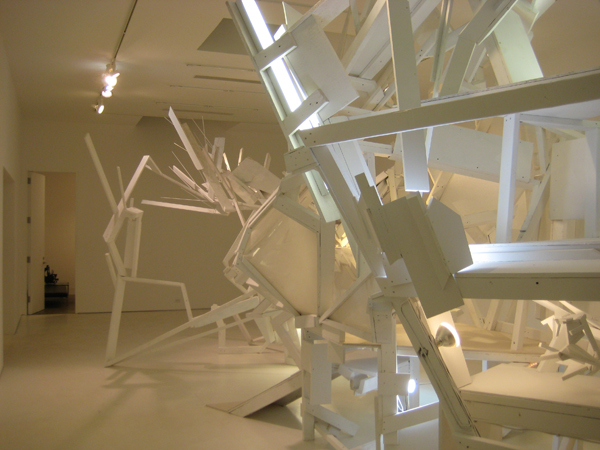 At Honor Fraser we were confronted with Gustavo Godoy’s Fast-Formal Object: Big White. 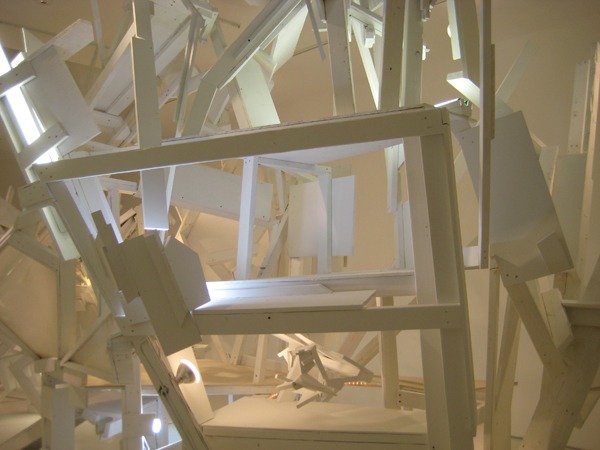 The installation is a seemingly random construction of various lumber, dowels, stamped sheet materials and concrete, painted white with its own lights built into it. It reads as a playful study of form, light and shadow, very architectural but also very drawing based, as many of the elements read like various line strokes. With a small platform inside and ramp leading it, it also gives off a constructivist playhouse vibe that keeps the whole thing from getting too serious. We stuck around for a gallery talk on this one, but I found I liked the work much better before I heard the artist talk about it. 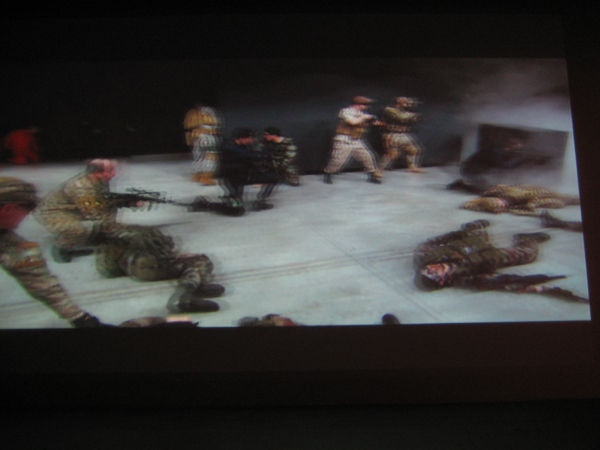 Also at Honor Fraser was a projected video piece by Fabien Giraud and Raphael Siboni in which teams of armed combatants battled among a landscape of movable black objects (much like large pedestals or gallery dividers) and theatrical smoke. 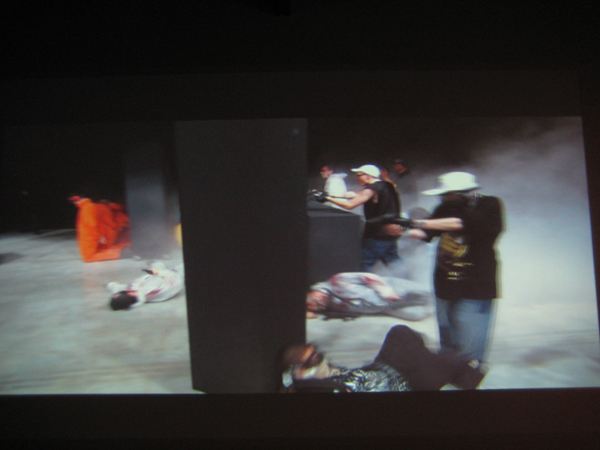 The groups, costumed as a military contingent, prisoners in orange jumpsuits, civilians, rap-gangstas, and zombies (?) in medical garb (am I missing any? perhaps there were some terrorists too?) played like video game characters brought to life. They ran towards each other across the space, clicking paint ball guns at each other (no added sound effects) and dying by the dozens. Each shot was a continuous tracking shot across the space, gliding smoothly by on rails, starting from the right hand side every time as the groups went through their maneuvers. 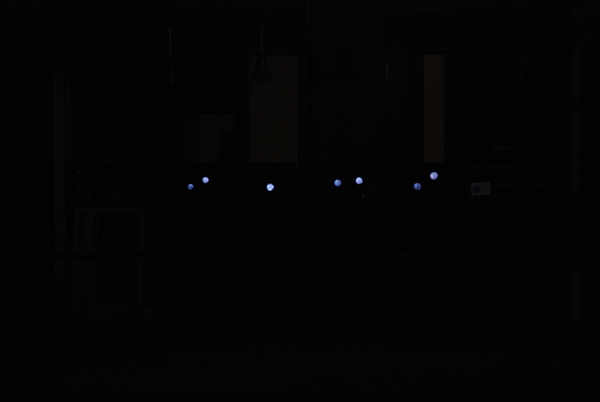 This one is part of Lab’s inaugural exhibition VideoRoam, a series curated by Paul Young. Lab is a sort of side project of Honor Fraser, “a forum for the explorations of the arts community in and outside of the Los Angeles area beyond the existing gallery program”. 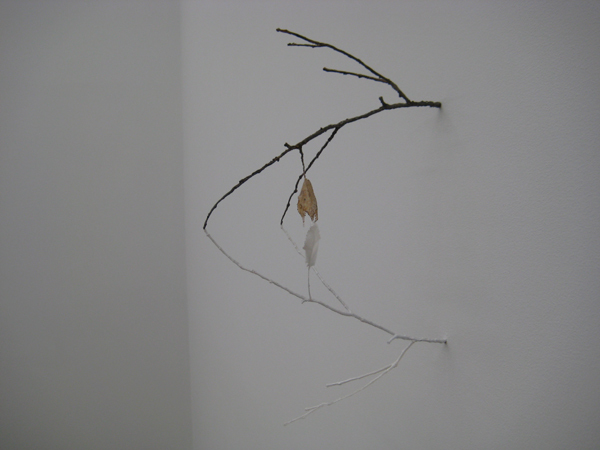 Finally, down at Angles Gallery, among paintings I didn’t care for at all, we found this little gem of a wall sculpture by Tom LaDuke – a delicate little bit of twig somehow mirrored as if hanging above the surface of a still pond. Around the corner from this, a vertically oriented video proved to be the highlight of our tour. 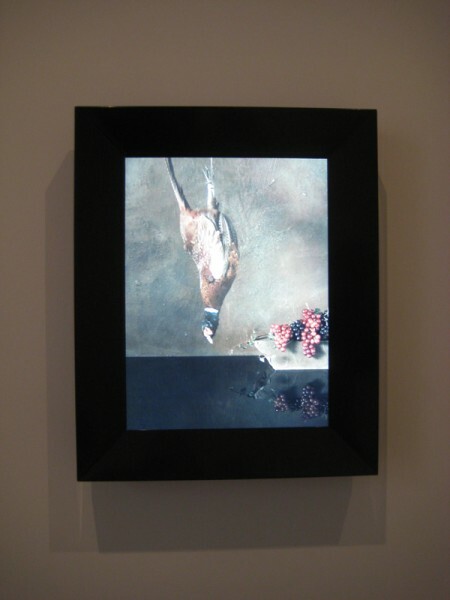 In crisp HD, a still life with hanging bird, grapes, water and plaster wall turns out to be a super-slow-motion shot of the bird simply dropping into the water below. The details of the feathers, the water splashing out into droplets, the sheen of the grapes, recalled old master’s still life painting – and more recently Bill Violas interpretations of the master’s at his Getty residency – but still managed to stay in itself a captivating work.